Coat: Marks & Spencer (old). Sunglasses: Ollie Quinn. Top: £59, Monsoon. Bag: £150, Kurt Geiger. Jeans: Topshop (old). 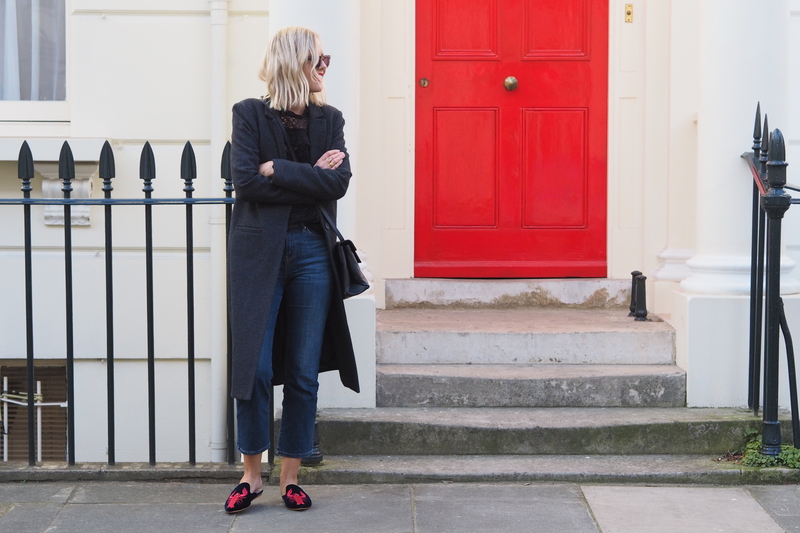 Mules: £130, Kurt Geiger. Photographs: Christopher O’Donnell. I remember writing a post way back when about investment pieces. But it wasn’t what you think. It was how, if I spend a bit more on something, I either want it to be classic plain black that I can wear everyday, OR it had to be a really statement piece that made all my other ‘plainer’ clothes’ sing. Case in point: both of these Kurt Geiger pieces. 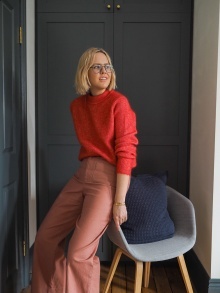 This is the perfect everyday workwear bag: chic, classic, a great size (it fits my iPad mini, my wallet and my diary – which can’t be said for most of my bags). The shoes are, well, the showstoppers. 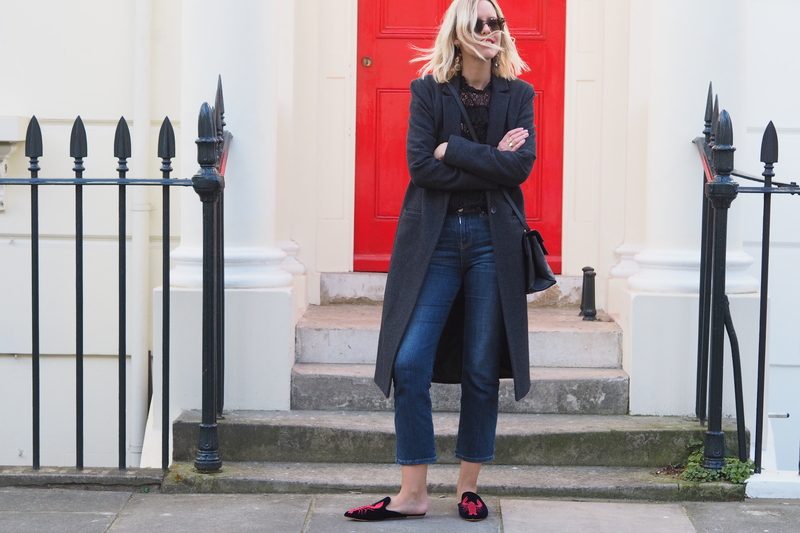 Just wearing these shoes on my Instagram Stories caused a huge commotion – they’re perfect for this time of year to add a bit of fun to my uniform of jeans and a tee. But I can also see myself wearing these on holiday, wafting around in a kaftan and in what feel like, basically, super luxurious slippers. 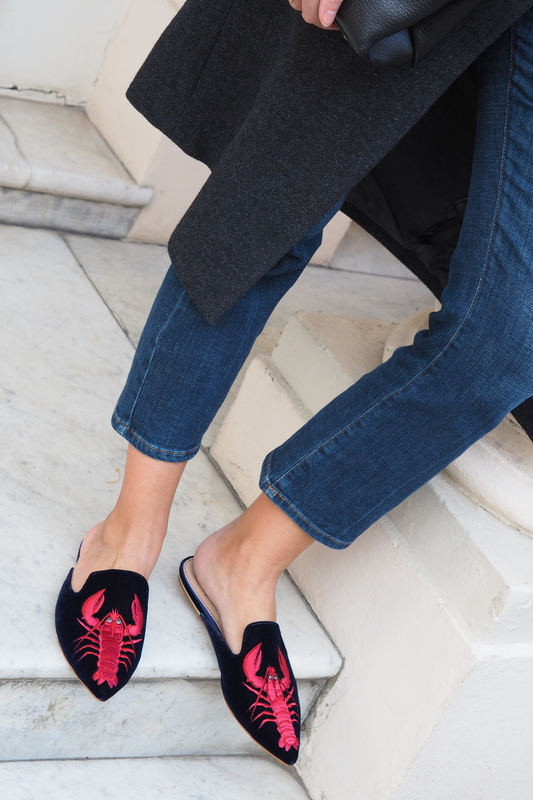 And I get the irony of wearing lobsters on my slippers when in fact I’ve eaten it approximately twice. And that was in a roll. Maybe that’s the appeal…? I know that some of you can’t do slip-on shoes, but I’m afraid to say they’re the shoe of the moment so expect a lot more from me. I’m not finding any problems walking in them right now and love how easy they are. The weather has been what can only be decribed as ‘glorious’ here in London, and although it’s often acceptable to be coat-free, I’m doing it just yet. It’s still that chilly in the shade kind of temperature and although the frilly eyelet blouse is being worn, I’m not 100% prepared to ditch the coat. Parkas and faux fur coats? They’re being put away this weekend. Coat: Marks & Spencer (old). Top: £59, Monsoon. Bag: £150, Kurt Geiger. Jeans: Topshop (old). Mules: £130, Kurt Geiger. This post was in collaboration with Kurt Geiger. All opinions, styling and Art Direction are my own. This outfit looks vintage to me! 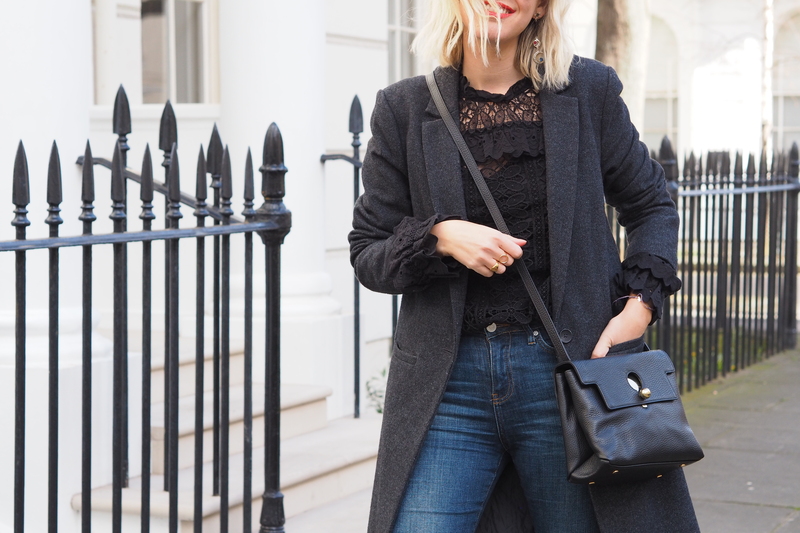 Love the charcoal coat worn atop black lace blouse tucked in shortened blue slim jeans. In love with flats. Love this look, I am tempted to purchase the KG bag in orange, but seeing the black on you now iam not sure…classic? Or statement? Oh..these shoes are so cool! And I really like you have red lipstick on, it just goes so nice with your outfit and shoes, very nice contrast. Love it! Great shoes. I first saw them on your Stories and had to get myself a pair! (although I got the white ones). Love your blog, I always enjoy reading it. I adore the shoes, just what I need for my summer’s in Brittany, where I regularly cook (and eat lobster!) such a fabulous bag too.